I have moaned more than once about my friend, Colette, being vegetarian as I find it difficult to come up with different and interesting vegetarian dishes for her. Colette either gets one of the few tried and true recipes or some strange concoction that shouldn’t be repeated. As a result, when I spy a vegetarian dish that looks interesting and tasty, I get a little excited. Such was the case when I spied this recipe in Suzanne Husseini’s Modern Flavours of Arabia. I showed Colette the recipe and it got the thumbs down. To my dismay, Maus was on Colette’s side. Not to be deterred, I decided to make it anyway. Let me tell you, it was fantastic. Maus, the fussy one, ate every mouthful and then apologised for being a doubting Thomas and … the next time Colette visited, she also apologised. The day before, she had been to a restaurant where they had just one vegetarian dish on the menu – roasted cauliflower – so she ordered it … and loved it. This dish is very tasty. The roasted cauliflower is sweet and delicious. The richness of the tahini is balanced by the citrus in the sauce. It is just perfect. Give it a go. As there were only two of us, I halved the recipe and it was just the right amount. These quantities would serve 4, with a side salad. Slice the cauliflower (core included) into thick slices. Try to keep the slices whole but don’t get too worried if it falls apart a bit. Line a baking tray with baking paper. Coat the cauliflower with olive oil, season with salt and then spread it out on the tray. Roast the cauliflower until it is golden and crisp and cooked through. Turn it over half way through. It should take about 20 minutes. Try not to break the cauliflower when turning it. In the meantime, mix together the lemon juice, orange juice and zest, water and tahini. Set aside. In a frying pan, heat 3 tablespoons of olive oil and gently sauté the onions and garlic until soft. Pour the tahini sauce over the cooked onions and bring to a simmer. Cook until the sauce thickens slightly. Taste, and adjust seasoning, if needed. Serve about one quarter of cauliflower to each person. 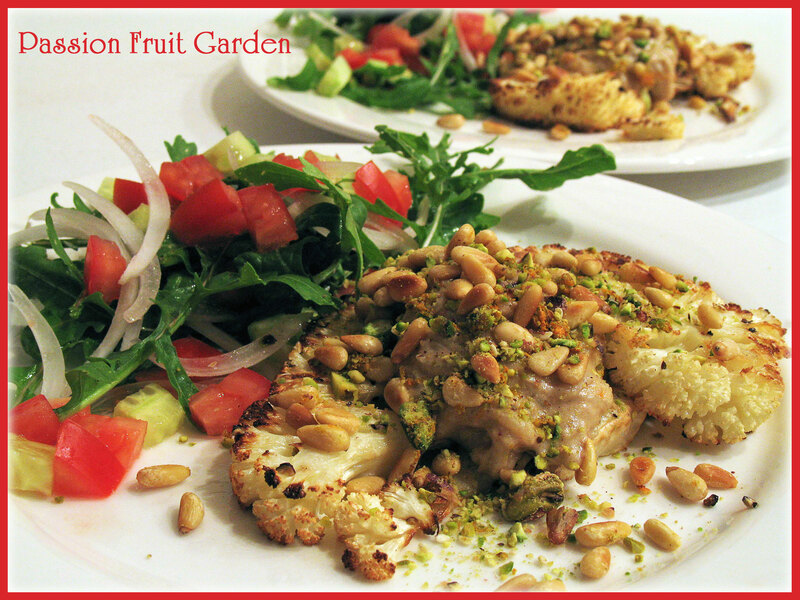 Drizzle the tahini sauce over the cauliflower and garnish with the toasted nuts and additional orange zest. This entry was posted in Vegetarian, What's for dinner? and tagged Modern Flavours of Arabia, Suzanne Husseini, Vegan recipes by Glenda. Bookmark the permalink. Hi Ayesha. Thanks for visiting and thanks for the compliment. Hi, we love roasted cauliflower and love tahini sauce. Might try cauliflower lightly steamed and finished on the grill during summer when I am loath to turn on the oven. Great photo Glenda, makes we want to sit and eat. Is that salad from your garden? Hi Madge. Thanks. Only the rocket came from the garden. It is still a wee bit early for cucumbers and tomatoes here – give it two weeks. For a log time, I avoided cauliflower. I just didn’t care for it when steamed or served raw and those are about the only way it was ever prepared. Now, though, I thoroughly enjoy it roasted. Adding this citrus-y sauce could only make it better. I gotta try this! Hi John It is funny how we avoid things for so long only to discover we like them. Looks fabulous Glenda, very similar to a recipe I make often (minus pinenuts), a family favourite. Hi Lisa. I can understand why, it is yummy. Although I am an omnivore, I LOVE veges, eat them copiously, by choice, and adore cauliflower any way… so YUM 🙂 I’ve been wanting to try baked cauliflower but sadly, it will be on a night when I’m eating solo, as the G.O. won’t even consider it. Ah, if people would just give things a try. Everything about this looks fabulous & now you’ve got me thinking that I could even sneak it past my non-cauliflower eating husband. I just got him to try a butternut squash soup that he admitted to liking so maybe just one new idea per week/month? Diane, I think they must be made to try new things. Do it. Colette is always very grateful for ANY food you are prepared to cook her Glenda. I found the idea of a large ‘steak’ of cauliflower a little odd. In my naivety I thought it might be a bit bland. I am very much looking forward to testing it out and always happy to be proven wrong on these matters! Hiya Colette. This one was a jackpot. We made a Greg Malouf recipe tonight that was also very good. When are you in B’town again? I am with you Maureen. I think panic is the appropriate response. That looks super. We love roasted cauliflower and the sauce would make a good change from my usual spices. Hi Pat, It sure was nice, rich from the tahini and fresh from the citrus.